The International Labour Organization is founded as a specialized agency of the United Nations that deals with labour issues. Its headquarters are in Geneva, Switzerland. Its secretariat — the people who are employed by it throughout the world — is known as the International Labour Office. The organization received the Nobel Peace Prize in 1969. Libyan leader Colonel Gaddafi has called for Muslims to declare Jihad against Switzerland, citing the recent Swiss ban on the construction of new minarets at Mosques. Libya and Switzerland have been in a diplomatic dispute since the Swiss arrested one of Gaddafi’s sons in 2008. 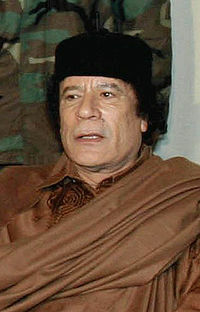 Gaddafi now states he would invade if the two shared a common border. Yesterday, the Colonel addressed a gathering in Benghazi to mark the birthday of the Prophet Mohammed. During the speech, which The New York Times described as ‘rambling,’ he said that “[t]hose who destroy God’s mosques deserve to be attacked through Jihad, and if Switzerland was on our borders, we would fight it.” He called on Muslim nations to reject entry from Swiss ships and aircraft, and asked Muslims to boycott goods from Switzerland. An American client of Switzerland-based bank, UBS, has won an appeal in Swiss court on Friday against providing the Internal Revenue Service (IRS) of the United States with relevant information about his offshore accounts. In an act of “propaganda of the deed”, Italian anarchist Luigi Lucheni fatally stabbed Elisabeth of Bavaria, Empress of Austria and Queen of Hungary and Bohemia in Geneva, Switzerland. In a concept that promotes physical violence against political enemies as a way of inspiring the masses and catalyzing revolution Lucheni sought to kill a member of what he felt was an elite and oppressive upper class,. The Red Cross movement led by Henry Dunant officially began when twelve European nations signed the First Geneva Convention, establishing the International Committee of the Red Cross. On August 22, 1864 several European states congregated in Geneva and signed the First Geneva Convention.